Today’s websites need more than just hosting. They need regular maintenance, backups and updates. Our managed website hosting plans include a full package of features that keep your site running smooth and secure. The modern website is software. And like all software it needs regular updating. Forget to update it and your website can break or get infected with malware. Most hosting companies just put your site on their server and leave it. This means you have to do all the updating, back ups, security scanning and file clean up each month – yourself. If you forget to do this your site could go down. Who has time to do all that? Our managed hosting takes care of all the important monthly tasks associated with your website. This gives you more time and less worry. Each month we send you a hosting report that includes information about your websites security, your Google statistics, your most recent updates, your websites speed, the latest backups and more. This report will help you understand how your customers are using your website as you build a stronger online presence for your business. Looking for a new web host? Host your website with Web 907 and we will migrate your site for FREE*. Our servers are fast, secure and reliable. Even if you don’t host with us you can still receive all the benefits of our managed hosting. We can take over management of your website no matter who you host with. The cost is the same, whether you host with us or not. *This is only for WordPress websites and does not include any domain registration fees. All our hosting packages include full backups of your website. Backing up your website is about safety. 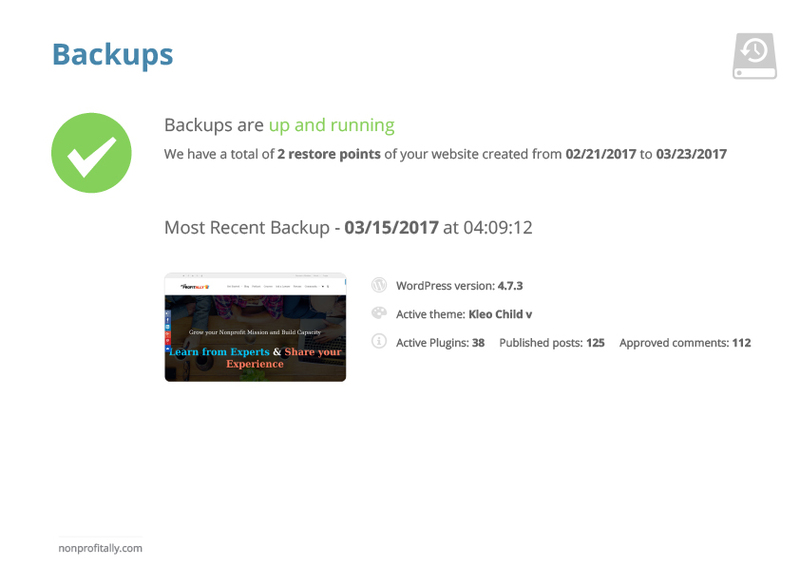 Having a backup of your website makes if possible to restore your site in case it gets hacked, the server hardware breaks or you accidently delete some files. Backups are a preventative measure that should not be overlooked. Each month we store a copy of all your websites files and database on a secure offsite server. Our hosting package includes a full year of backups so you can restore your site from most any time. A WordPress website needs regular maintenance and we do it all. Modern websites are software. And like all software they need regular updating. Letting your websites plugins and theme files get out of date leaves your website vulnerable to hacking and breakage. Our website hosting includes full management of your sites WordPress installation, plugins and theme. 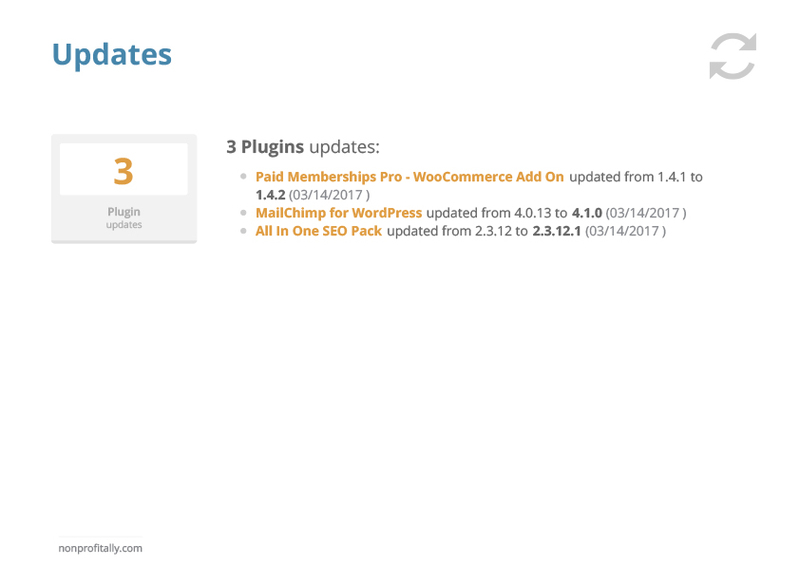 We will update all your plugins and themes multiple times each month. Searching for vulnerabilities that threaten your website. Having malware or being vulnerable to attack means your website is at risk of going down. A malware infection can ruin your website, damage your online reputation and get you blacklisted from the search engines. 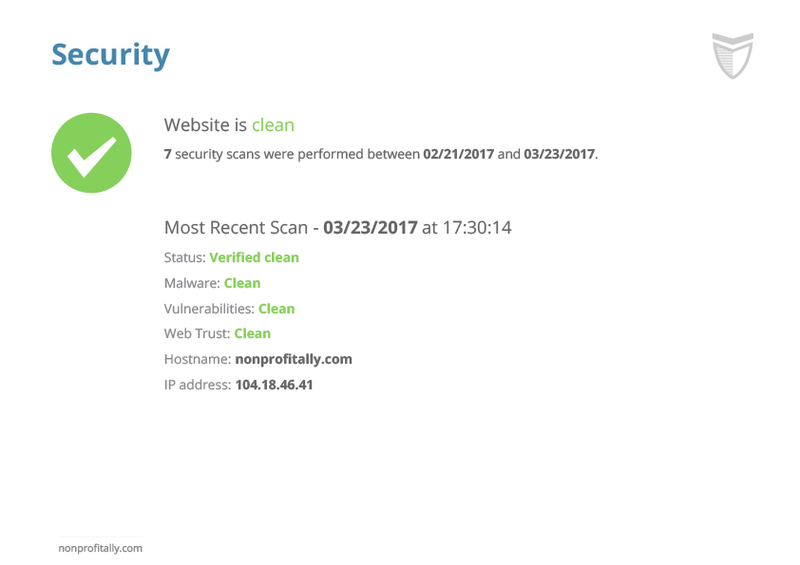 Our hosting service includes monthly scans of your website to see if there are any potential or existing vulnerabilities on your website. We also check to see if your site has been blacklisted by any of the search engines. If any threats are discovered we will contact you to discuss methods to remedy the situation. Cleaning up the files that slow down your site. As you update and revise your website it stores old files in your database and file cache. 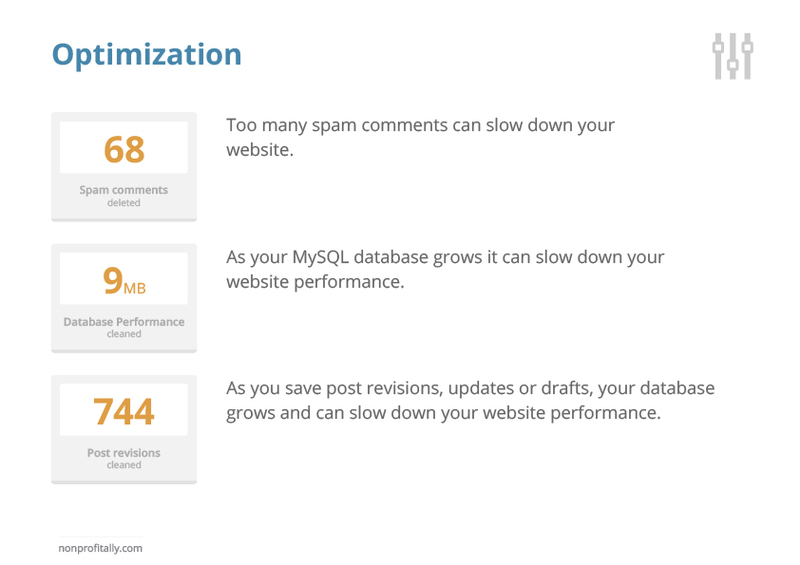 This clutter can slow down the performance of your site and leave your visitors frustrated with your websites speed. Each month we remove the old unused files from your websites cache, database and spam comment folder. This regular cleaning keeps your site running smooth and efficient. Knowing who visits your website is just the start. Knowing how many people visits your website, what pages they go to and how long they stay are important things to know when growing your business. 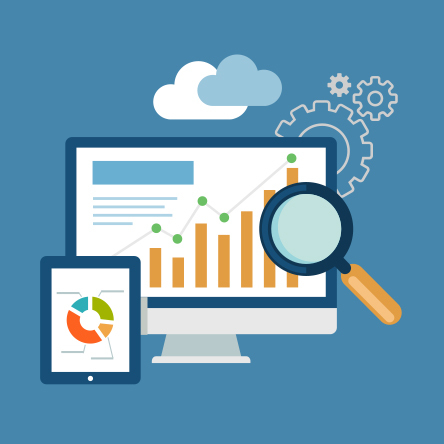 Google Analytics will tell you how they found your page and even what search terms they used to find your site. Knowing all this will help you keep up with your competition and improve your website rankings. 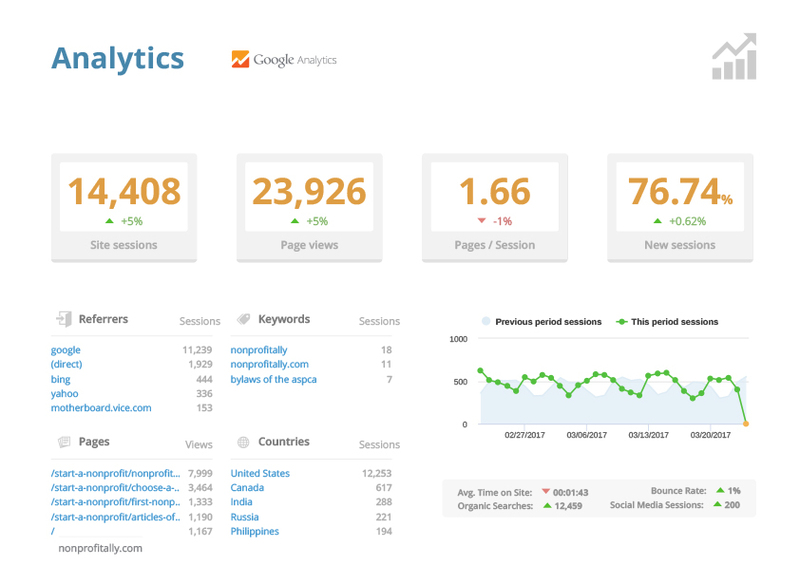 Web 907’s managed hosting connects to your Google Analytics account and gathes all the vital statistics you need to know about the visitors to your website. This information is pulled into your hosting report so you can learn more about how your customers use your website (see image at right). Not connected to Google? We can do that. Just how fast is your website? Slow sites frustrate your visitors. Slow sites loose customers. And worst of all, slow sites rank lower in Google search results. So, knowing just how well your site is performing will help you improve the experience your customers are having on your website. 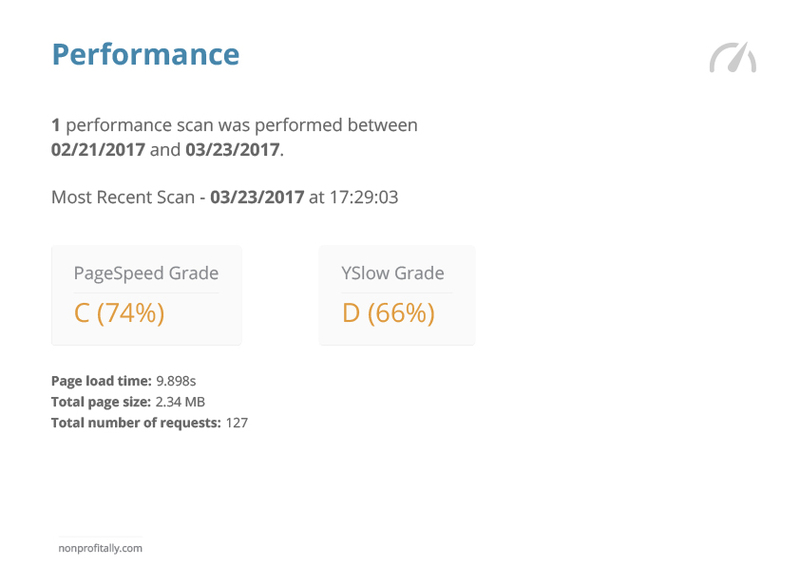 Each month we scan your website with two different performance checkers and include the results in your web hosting report. We also include information on your websites load time and page size. If you see you site is performing slow we can do an analysis to determine how best to speed it up. Contact us to help speed up your website. If it can’t be measured it can’t be managed. Monthly reports keep you upto date on everything that is happening with your website. They will alert you to vulnerabilities, inform you of customer trends and remind you how important your website is to your business. 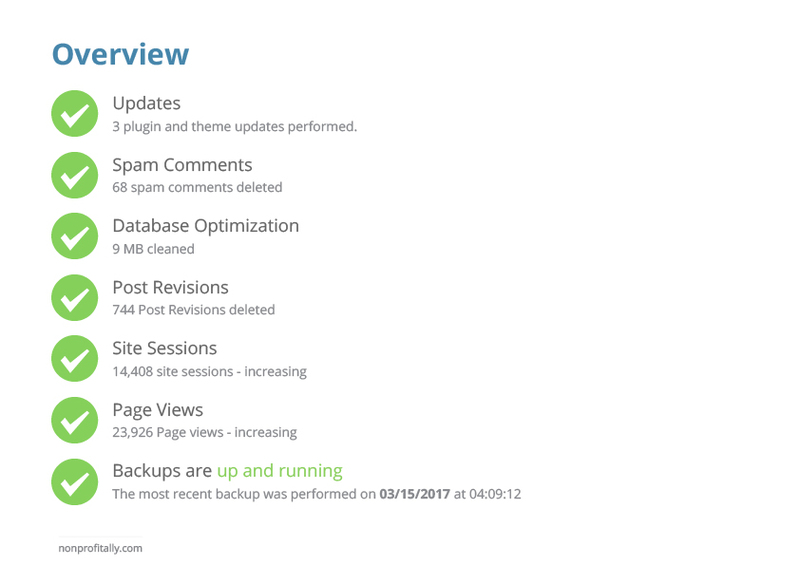 At the beginning of each month you get a report documenting all the updates, optimizations, backups, analytics and security scanning that has been done on your website. All the screenshot images you see on this page are from an actual web hosting report that we produced. How cool is that? How many hosting companies do that? All hosting plans come will technical support to help you with your hosting needs. If your website is acting funny, gets attacked by a hacker, infected with malware or is loading slow we can help. Need support? Just contact us.